Designing power distribution centers just got a whole lot easier. Our new online configuration tool lets you configure standard and custom AMAXX® power distribution centers in just a few mouse clicks. 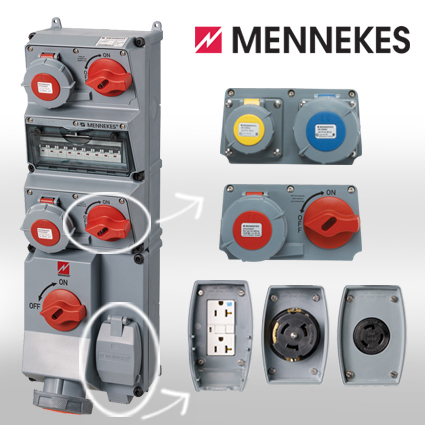 The AMAXX line consists of high performance non-metallic enclosures that can hold many different combinations of disconnects and receptacles—including switched-and-interlocked, GFCI and NEMA devices. AMAXX enclosures are available in one- to five-gang units, all UL listed. Using the new configuration tool, you can build a standard or custom AMAXX power distribution center in less than a minute. The configuration tool can optionally submit an instant request for quote to a MENNEKES application engineer.